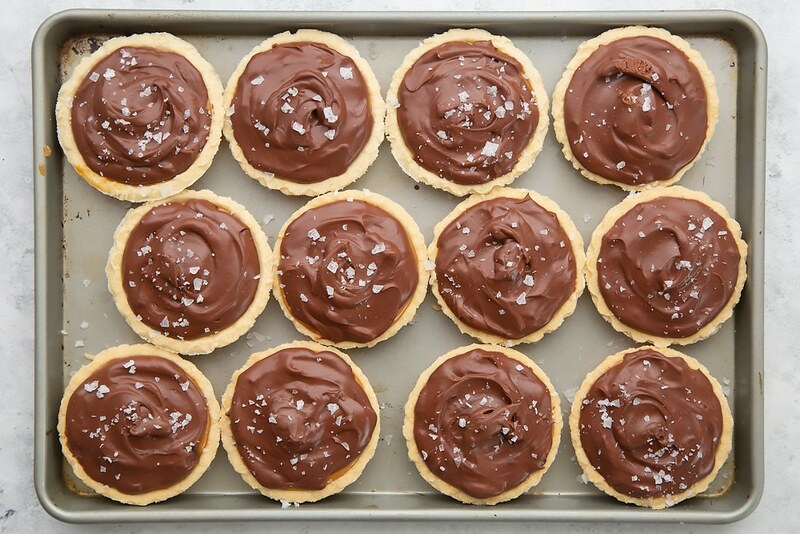 These Baileys salted caramel mini chocolate tarts are stunningly delicious. 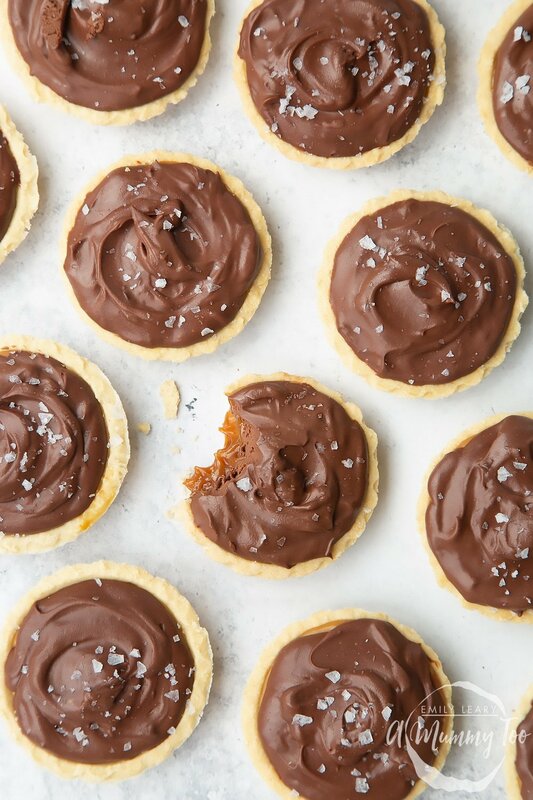 Sweet shortcrust pastry, a layer of salted caramel, topped with creamy Baileys and chocolate ganache, and finished with a sprinkle of sea salt to bring out the flavour. Here’s the speedy, cheaty, 6-ingredient recipe. Lay the pastry cases out on a tray. 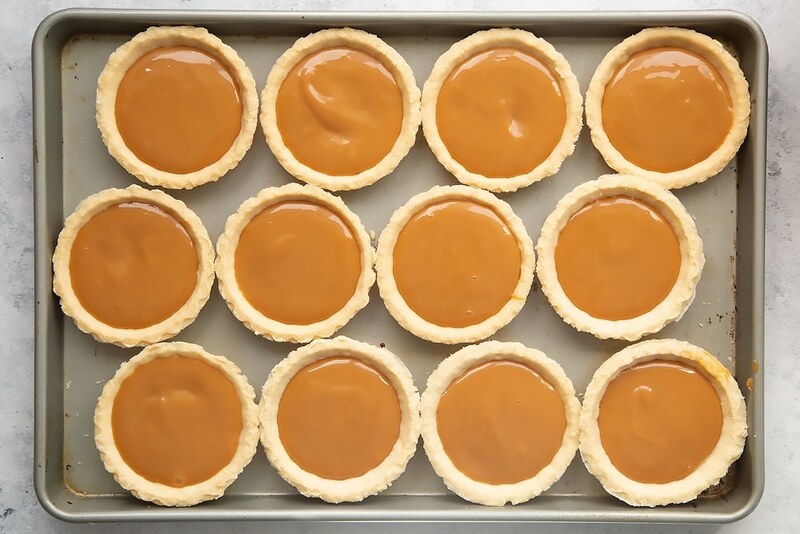 Spread a rounded teaspoon of salted caramel onto the base of each pastry case. Place in the fridge while you make the ganache. Melt the dark chocolate in a large heatproof bowl, leave to cool to room temp. Pour in the cream and Baileys. Whisk! At first it might look a little dull and granular. 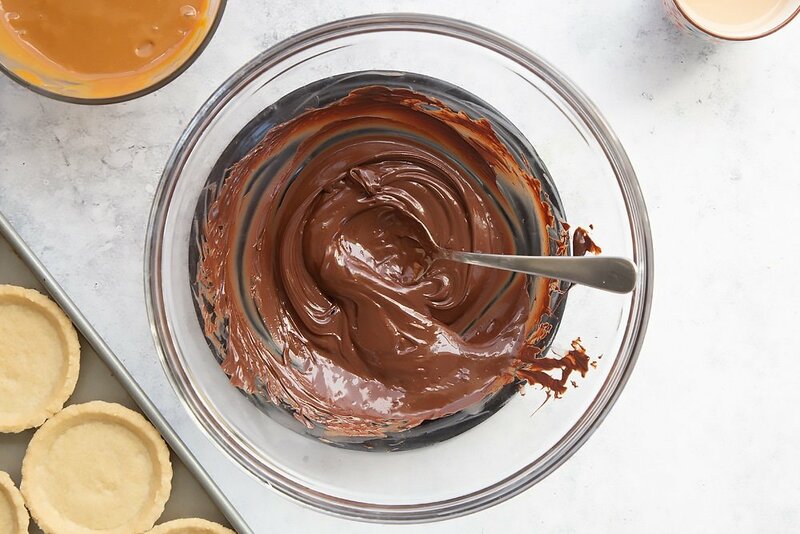 Keep whisking until you get a thick, glossy ganache. 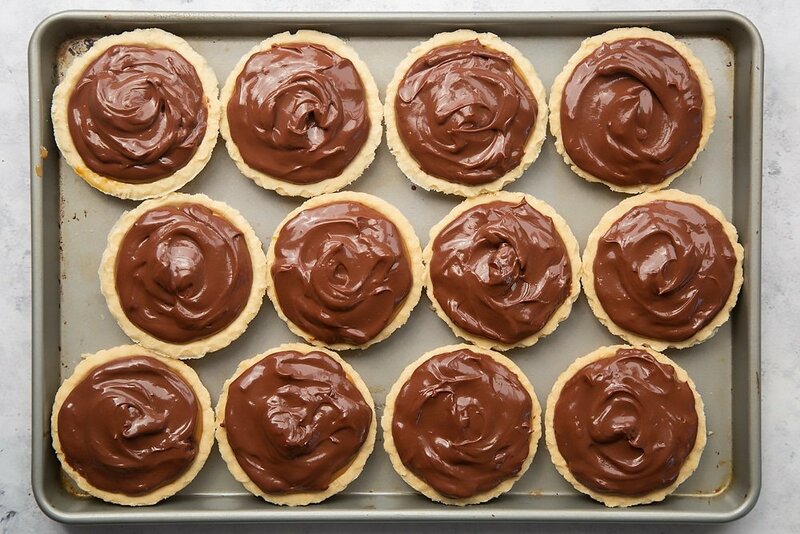 Spoon the ganache into the pastry cases, swirling gently to the edges. Place in the fridge for a couple of hours, or the freezer for 30 minutes to set. Sprinkle with a little sea salt to serve. If you’re like to print this recipe to try later, just hit PRINT on the recipe card below. 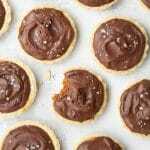 Sweet shortcrust pastry, a layer of salted caramel, creamy Baileys and chocolate ganache, finished with a sprinkle of salt. 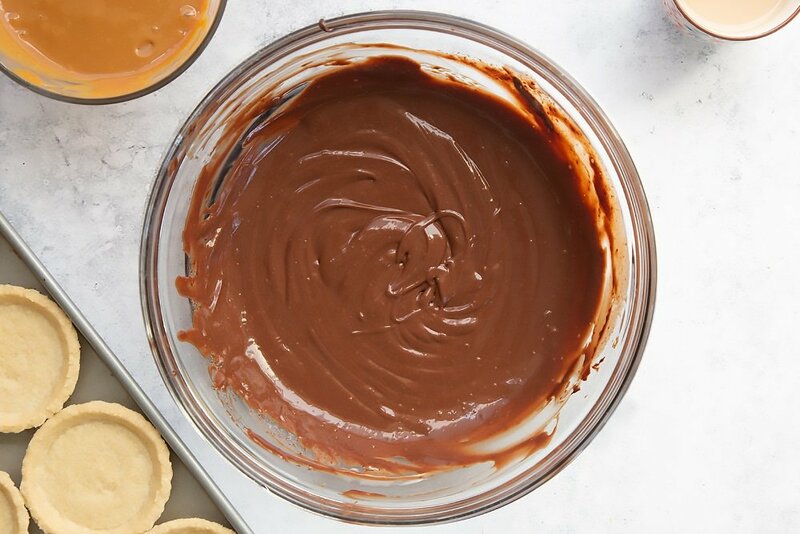 Pour in the cream and Baileys and whisk until you get a thick, glossy ganache. 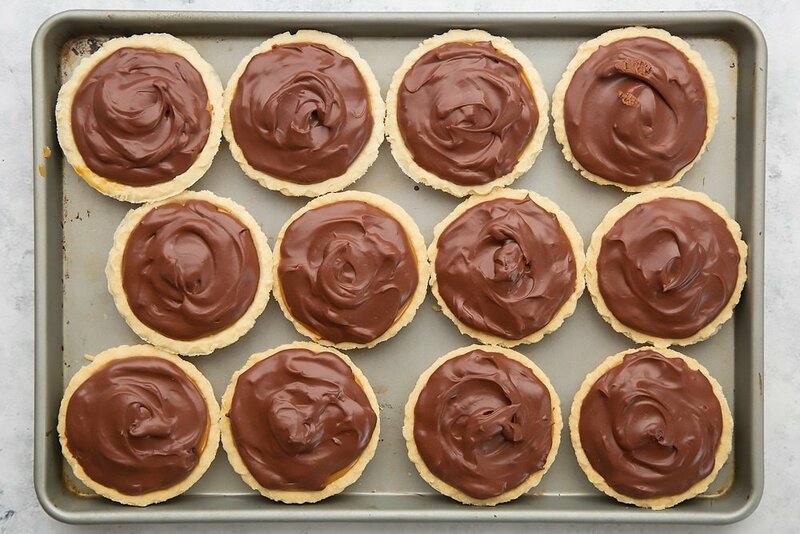 Spoon the ganache into the pastry cases until full, shaking the cases gently to level off. 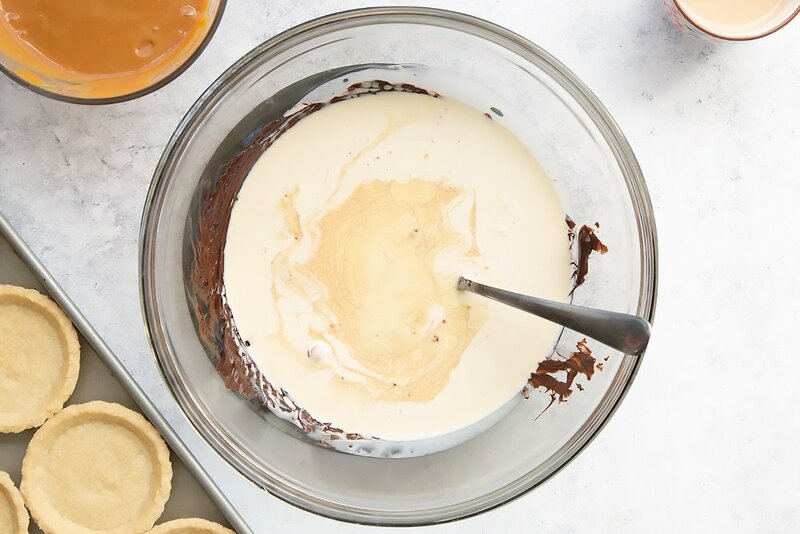 You might not need all of the salted caramel and ganache, depending on the size of your pastry cases. Looking tasty? Don’t forget to pin for later! 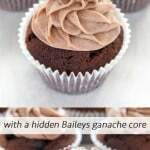 If you enjoyed these Baileys salted caramel mini chocolate tarts, why not try these tasty chocolate caramel choux bites? 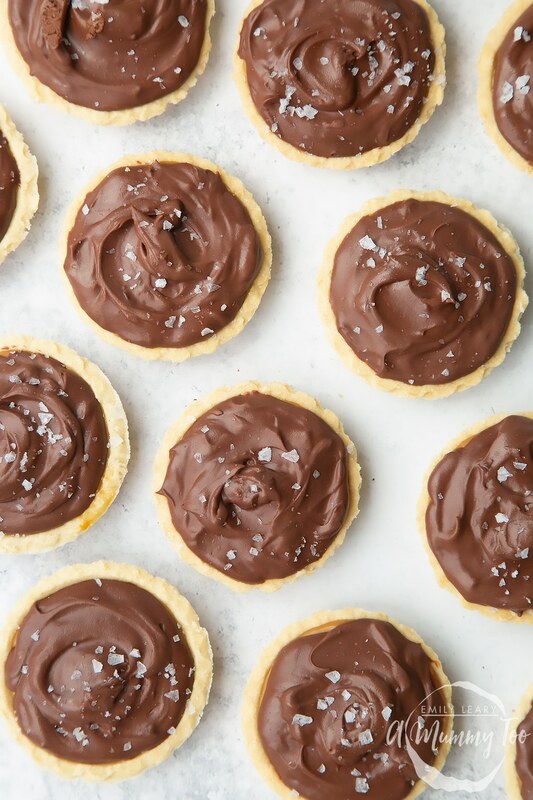 Can these tartlets be made the day before? They look absolutely delicious !! 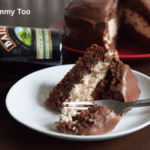 Would the ingredients amount/method have to be changed if the baileys wasn’t added? Yes, just up the cream content to replace the amount of Baileys you would have used. It doesn’t have to be too exact, though – the ganache is pretty forgiving if you don’t get the amounts spot on. 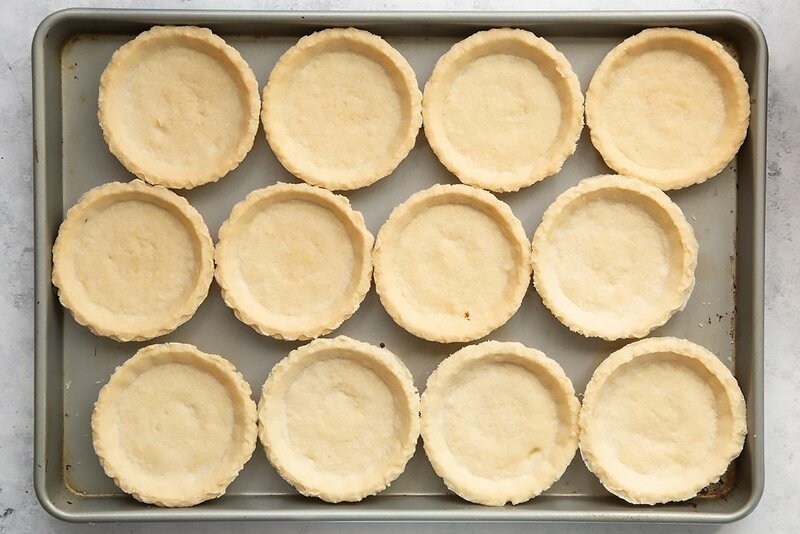 Did you make the pastry tart cases, or did you buy them? Hi Emily! These tarts are gorgeous!! 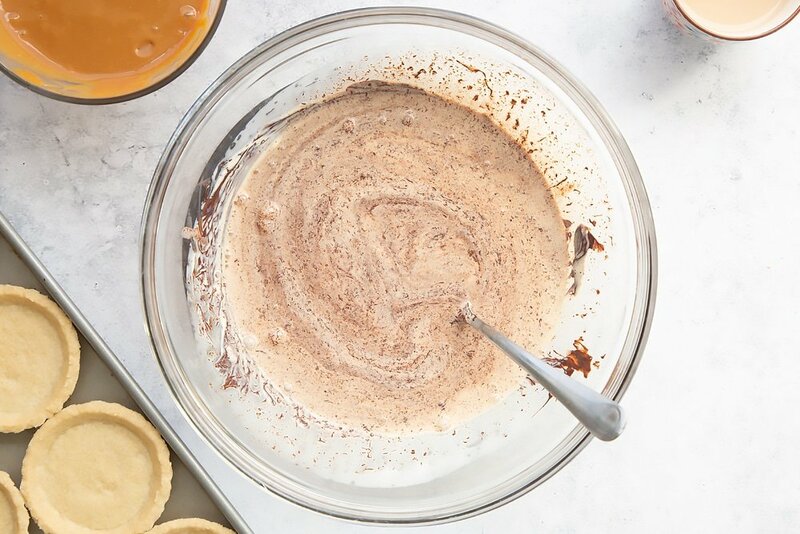 I’d love to include your baileys salted caramel mini chocolate tarts recipe in a chocolate dessert roundup I’m preparing for Parade Magazine. if you’re fine with it, could I use one of your photos with a link back to this original post? I am so sorry I missed this. I’m sure it’s too late now, but for future reference, you’re welcome to use an image and link from any recipe post in a Parade round up. 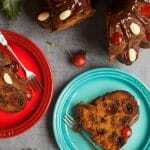 What a great recipe and photo! This ticks the box for all the flavor combinations I love! Pinned and shared! Wow! These look incredible! I would just LOVE to have one (or two!) to myself. Simply beautiful! 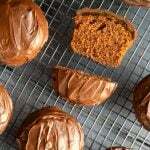 would it be ok to use plain caramel? And milk chocolate? Normal caramel would work fine as long as it’s quite a firm kind (ie not a really loose sauce). And milk chocolate would be ok but you might want to reduce the cream content a bit as milk chocolate is softer than dark chocolate and so the ganache might take a long time to set. 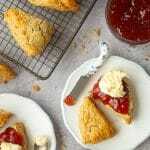 These are so pretty and I love how simple they are to make yet so impressive and of course delicious! Emily!! this looks sooo good. I feel like I can taste the chocolate and baileys and caramel just looking at the pictures! Hello from Buenos Aires, btw! What a great idea … so simple, yet so elegant …will be trying this one out this weekend. Can you tell me where I can get salted caramel please. Baileys is always a crowd pleaser. Hiding my eyes from these until I’ve finished a week of salad eating! Oh my goodness – Baileys, chocolate, caramel – did I die and get in heaven?!? These look perfectly creamy and the flavor mix sounds just right. Yummy in my tummy! I wish I was your neighbour Emily! Oooo yum! My mouth is watering just looking at these. They look incredible. What an invention!!! WOW – these look stunning! So lovely and I adore salted caramel. This is truly sensational Em, oh my goodness so many flavors of my favorites together in one dessert. When I am done with my 30 day challenge I just may have to celebrate with one of these! WOW…pinned it to pinterest immediately. I saw this on Instagram and it made me drool. Love Baileys in dessert and I’m obsessed with salted caramel. I make a baileys fudge pie with salted caramel cream and it was dreamy. I’m going to have to make this! Oh I’m drooling over my keyboard over these beauties! Thank you. I don’t see why not! They look absolutely delicious, Emily! Beautiful photos! I would so love one now! :) Pinned. I love the miniaturisation of this indulgent treat. There’s hardly any calories, right? Oh my woooord these look unbelievable. I can’t resist salted caramel! And adding Baileys sounds AMAZING. As soon as I saw this on Instagram I was sold- I love baileys, I love salted caramel and cheesecake too? Winning. This is amazing Emily!